A long time ago, I returned to Australia from a study trip to Chile where I had spent three months travelling around with nothing but my backpack. Upon returning home, I was shocked to realise how much stuff I owned, and how little I missed it during the entire time that I was away. It wasn't that I was horrified that it must mean that I am a materialistic, superficial person. Rather, my possessions now appeared alien to me, as though they belonged to another person entirely. I began a long process of getting rid of things, only holding onto that which was useful, meaningful, or both. 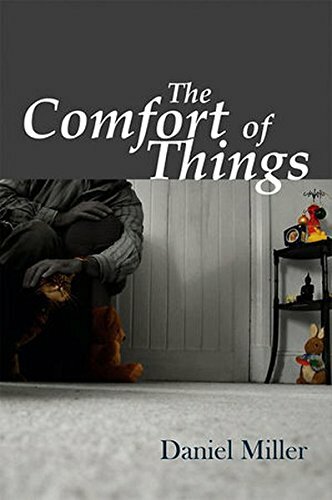 I don’t think I ever really understood what I was doing, or why I was doing it, until a decade later when I read The Comfort of Things. Daniel Miller paints thirty startling portraits of households in a single London street, demonstrating how important our material things are to our social lives. In other words, our possessions enhance our relationships with other people. This revelation should not really surprise us. After all, the main thing that differentiates humans from other animals is our deftness at using tools and manipulating aesthetics. Self-decoration and art were as commonplace among Neanderthals as they are on High Street today. What’s different today is that, in this age of mass consumption and global trade, we have a dizzying array of objects to choose from, and also far more individual choice as to how to use objects to create our identities. Nevertheless, our choices are still always social acts. The first chapter in the book, ‘Empty’, is one of the most devastatingly sad accounts of a human life that I have ever read. It is about an elderly man called George, whose flat contains nothing but the most basic furniture, and a complete lack of any decoration whatsoever. After living in a series of hostels all his lives, George found himself living alone for the first time at the age of seventy-five and having to learn to care for himself. He had no family and no friends: like his flat, his life was empty. If he had any social connections at all, there would have been some material indicator in his life – a photo, a memento, a ticket stub. The household depicted in the second chapter, ‘Full’, is at the complete other end of the social-emotional spectrum. This family are fully alive in a social sense, and this is reflected in the highly meaningful content of their possessions. At Christmas time, this family comes into its own. The tree is adorned with handmade decorations that remind the family of their ancestors. Each object has memories attached to it that give Christmas continuity as a family event. Things, people, and rituals are all integrated in such a way as to create the most meaningful social life that is possible. It was the chapter called ‘The Aboriginal Laptop’ that reminded me the most of myself. A young man called Malcolm has numerous possessions, but because he lives a transient life, most of them are in storage. As a result, his laptop has become the central material object that is his home. Whereas most people have a (relatively) permanent home address, Malcolm has an email address. He organises his work and his friendships through it, and reduces the weight of the material things he must carry around the world by converting them to digital format. This approach allows him to live a mobile lifestyle while still taking advantage of the social facilitation that material things provide. I think that my trip to Chile turned me into a person like Malcolm for two reasons. First, the experience of being away from my things made it clear which ones I was attached to and which ones I was not. Second, my enjoyment of being mobile, and my wish to be a more mobile person in the future, motivated me to make it easier to pack up and leave in the future. Hence there is a dynamic relationship between how our things define our values, and how our values define our things. One could argue that Malcolm’s laptop became his home because he didn’t have a fixed abode, but I suspect that it was because he valued transience above being in the one place. Ten years and a lot of travelling later, I'm still trying to reduce my stuff to maximise my mobility. But this doesn’t simply involve not buying things – rather, it is a constant process of decision-making about what to do with the things I unavoidably collect. Whether one owns lots of possessions or very few, materiality is a constant force that we reckon with as we negotiate our lives.